Six layers of 100% cotton ruffles! Made in the USA exclusively for Summers at the Cottage! Oodles and oodles and layers and layers of dreamy white ruffles! The detail and workmanship is incredibly beautiful. 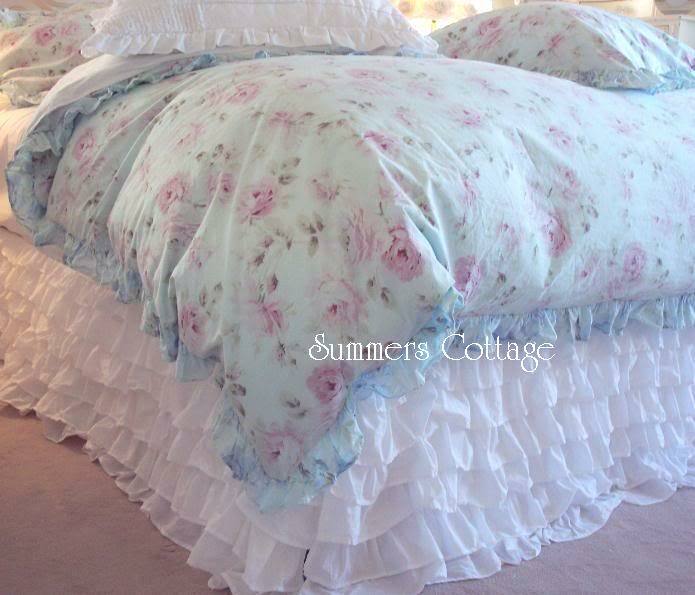 Truly the most exquisite elegant chic bedskirt ever! 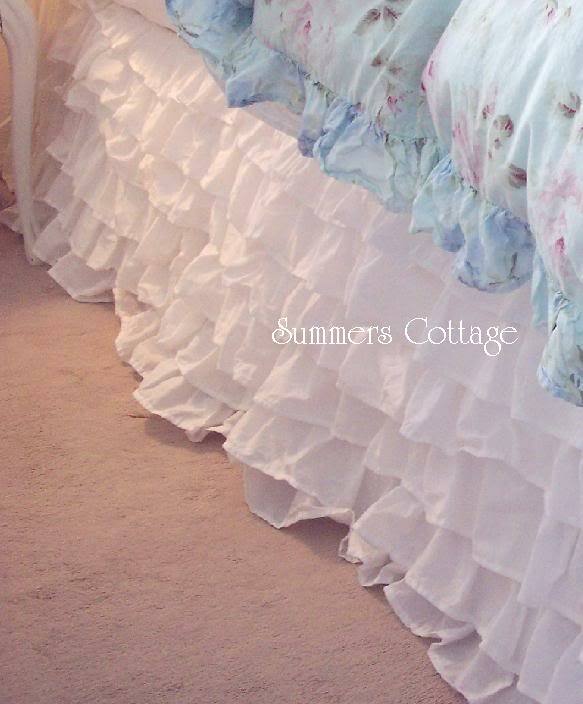 This stunningly beautiful bed skirt has 100% cotton ruffles with 6 dreamy layers of ruffles! 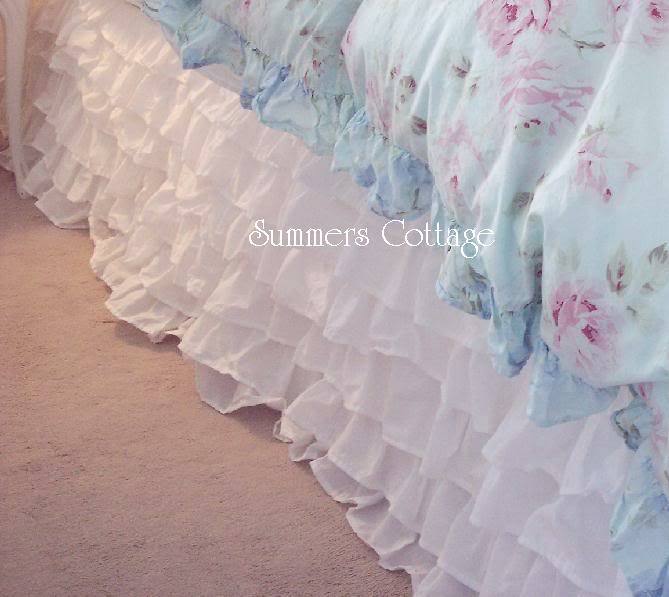 This gorgeous bedskirt has split corners too. Perfect to use with or without a bed with footboards. Perfect for a shabby chic romantic cottage home! With a generous 16 inch drop this lovely bedskirt is perfect for most beds, but if you have an extra high bed this looks wonderful layered over an existing bedkirt! 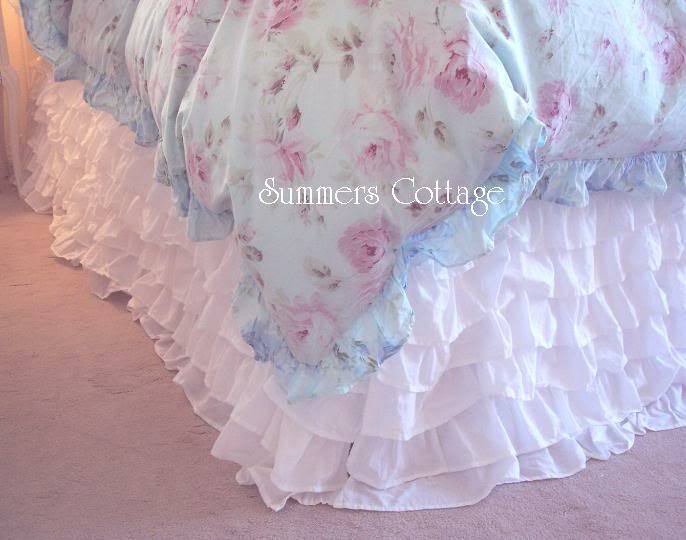 Brand new in package, this gorgeous dust ruffle can be used on your King size bed, and for those creative types, it could be altered and made in to a dreamy layered table cloth! The beautiful layers of fabric alone have a zillion uses! From the Hamptons to the San Francisco Bay area, this bed skirt is fit for homes with true shabby elegance! Although this is not from the Rachel Ashwell Shabby Chic Collection, it is shown below on a bed with this designers Boho Aqua Blue Pink Roses Sugarplum Sorbet ruffled duvet, and this is the ultimate bedkirt to use with any of the bedding we offer! Machine wash and dry. Tip - we wash linens in cold water and low drying heat. For ruffled items, take out of the dryer when still slightly damp. 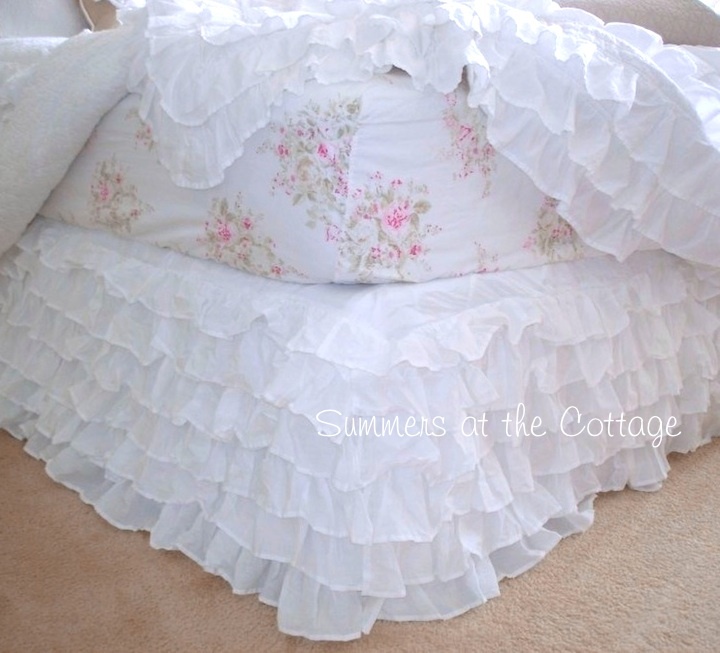 Lay on top of the bed to fluff the ruffles and it will be gorgeous!